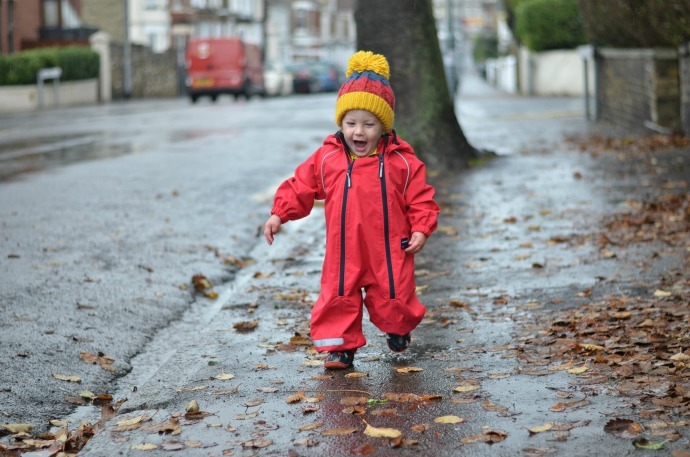 Having small children I have had to adopt the attitude that there is no such thing as the wrong weather, just the wrong clothing, and even in the depths of winter we like to get out and be active every day. It is the first time Finn will get to really experience this season as last year he was tucked up cosy in his buggy or wrapped up warm in the sling. This week I took him puddle splashing for the very first time and I loved watching his face as he realised he really was allowed to stomp right through a puddle. 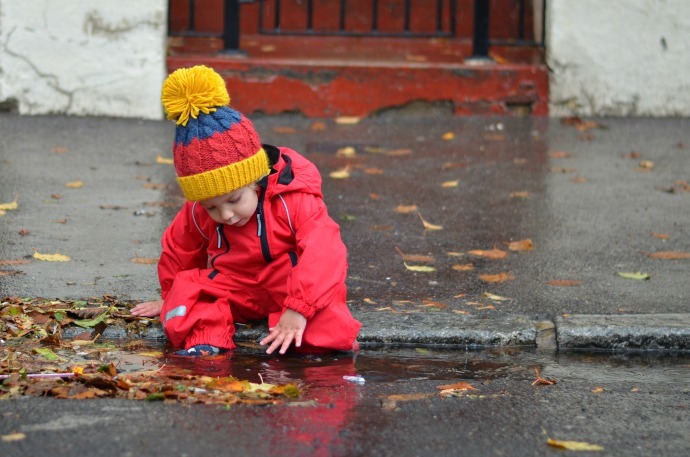 Puddle splashing is our favourite rainy day activity and over the four years that I have had a walking child we have learned where all the best puddles are. Even when it is cold and wet we like to get out for a short time and it is the perfect way to stretch little legs, blow off the cobwebs and break up the day. This winter I will start encouraging him to walk more and be in the buggy a little less, he will start running around with his brothers more and I need to know he is well protected. I find myself climbing the walls when I am indoors with all four for too long so we will be out everyday for my sake as much as theirs! I love the reflective strips on this which I think will come in very useful as the night's start earlier and the double zip makes it easy to get on and off. 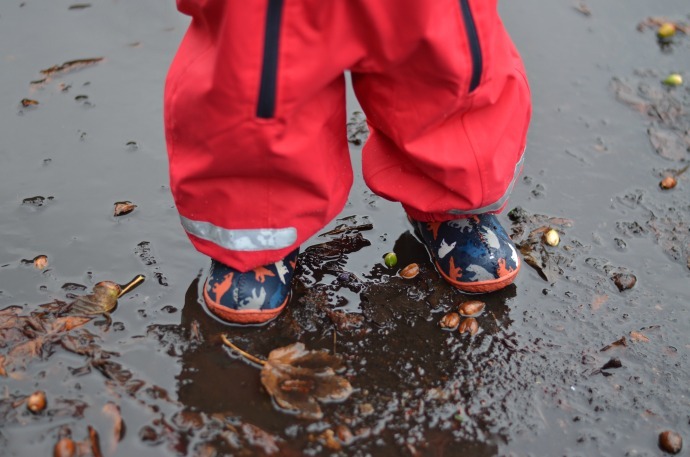 There is elastic on both sides to go under the wellies to help keep everything in place and keep water out. 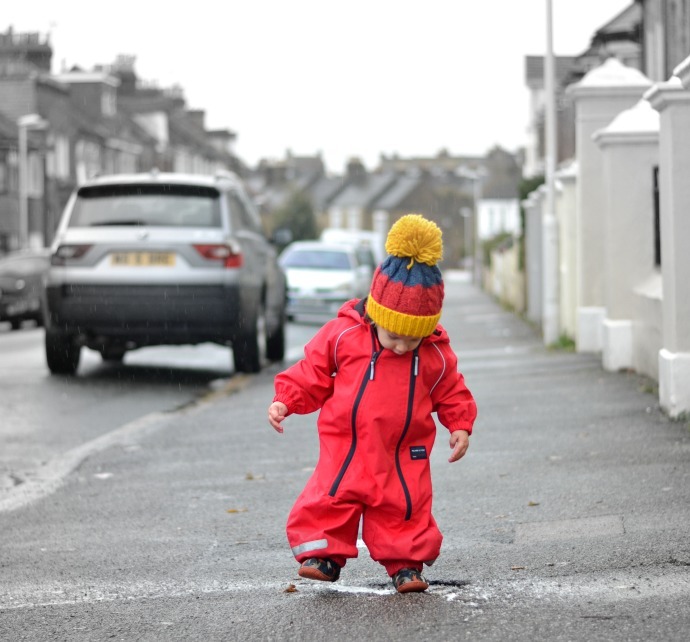 Our winter is going to be cold and wet and so much fun and as long as we are all dressed up cosy and waterproof we will be enjoying it outdoors as much as we can. What a gorgeous, vibrant outfit! This is the PERFECT antidote to all of that grey wintry weather... I love it! This is awesome, I was having the discussion yesterday with my brother and his wife on how to effectively keep the kids warm and dry, especially after the amount of rain we’ve had the past week. I bought new coats for our little ones recently that are supposed to be waterproof but when they have got wet the rains gone through and soaked they’re clothes. This suit looks like a great solution to keeping them mostly dry while they tot around on dog walks, one investment that I have made is welly boots. They are incredible, durable as anything I’ve ever had for myself and they keep water out, partnered with this suit we’re going to have some watertight little ones for the rest of this winter! Great suit but his hat!!! Love it. Oh look at those gorgeous little feet at the end there! The quote at the beginning is one I keep in mind a lot of the time!